Certified Scrum Master is one of the most popular and globally recognized certification offered by the reputed Scrum Alliance. This coveted credential is offered to those professionals, who have successfully completed CSM training and have proven their skills in Scrum terminologies, practices and principles in the CSM exam. CSM provides better and greater job opportunities to professionals who wish to build a strong base on scrum and agile practices and development. Project managers across industries, product owners, software architects, developers, testers, coders etc., seek to take up this certification. Although there are no set eligibility requirements for certified scrum master, it is advisable to have some understanding of the principles and possess working knowledge of the overall scrum process. The candidate must understand the individual roles of product owner and development team. 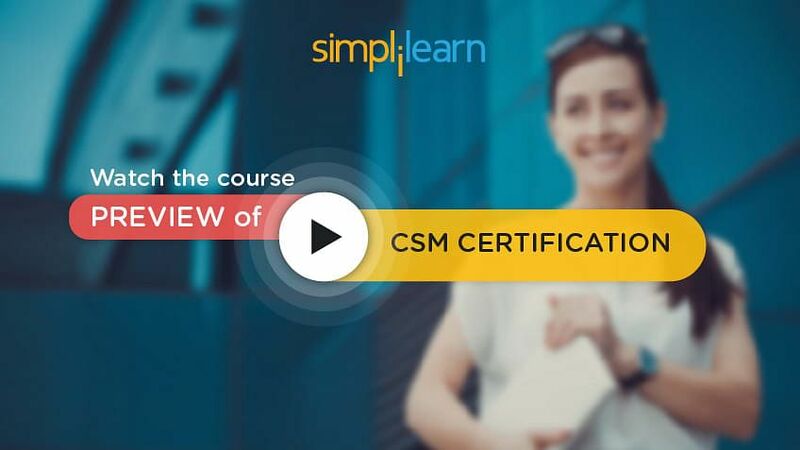 In order to get certified, a candidate must take up the two-day CSM course from a Certified Scrum Trainer (CST), post which an online exam must be cleared. This training is considered to make one exam ready with some amount of dedicated self-study. CSM training can only be imparted by CSTs or Certified Scrum Trainers. A CST is a senior professional within the Scrum community who has attained this status only after a rigorous evaluation process by the Scrum Alliance. Simplilearn, world’s largest certification training provider offers extensive Certified Scrum Master certification training from highly qualified and experienced CSTs. You can also earn 16 hours of PDU (in compliance with the PMI’s guidelines) certificate after the successful completion of training. You can use these PDUs if you wish to take up Project Management certifications in future. The exam consists of 35 multiple choice questions and to pass the certified scrum master exam, you need to write 24 or more correct answers. You can take up the exam only after the completion of two days training. The test takes about an hour to get completed. You can take breaks, pause and restart the test as many times as needed. You can also skip questions or bookmark them for later review. Go back option is always there throughout the test. You can review bookmarked questions at the end of the test and submit your answers for scoring. After clicking submit button, a warning message may appear in case you have left any question unanswered. Your score will immediately appear on your computer screen. What if one fails to pass the CSM in one go? In the event that one fails to pass the CSM exam in one go, you may take it anytime within 60 days following your CSM course. You can even retake the exam immediately if you wish. However, if you fail to clear the exam in second attempt too, you will be required to pay an exam fee of $25 to Scrum Alliance. Scrum Alliance recommends that it is better to re-enroll in the CSM course, if one has failed thrice in the exam. How does one complete the CSM evaluation and receive Scrum Alliance Certificate? You will receive an email containing the log in information from Scrum Alliance within five days of taking up the course. You can log in to the Scrum Alliance website and complete a free, non- graded online evaluation. Once you have submitted this online evaluation and agreed to the terms and conditions, you will be able to download and take a print out of your certificate directly from the Scrum Alliance website. You will then need to complete your Scrum Alliance membership profile after signing the license agreement.